As a Social Media Strategist or as my mom puts it, “professional Tweeter,” I pride myself on not only finding and engaging online influencers, but being one myself. It’s my humble opinion that in order to engage your brand’s most active users, you must walk a mile in those users’ shoes. I could only register one of my Twitter accounts. I have 2, but the one associated with my main email address (and thus searchable by potential employers) is only 2-months old. So I went with my personal account, which has more followers. I’ve just started to use Foursquare. I absolutely love it and have earned quite a few “first check in” badges. I only have about 9 friends, though, which has more of an influence on my overall score. Linkedin is a resource for me as a young professional, but sadly, I linked my Klout to the Linkedin page for my previous employer and have lost access to enable me to revoke permissions. I will try to raise my Klout score to 72 by January 1, 2013. Why 72? Well, according to Wired.com’s infographic, Sarah Palin’s people have managed to get her that score. Since I tend to tweet for brands and individuals far less cuckoo-bananas than Ms. Palin, it would actually pain me not to match or exceed her publicists’ Klout score. At least I have a higher Klout score than the Aflac duck. So, here’s to (completely amateur) scientific inquiry! 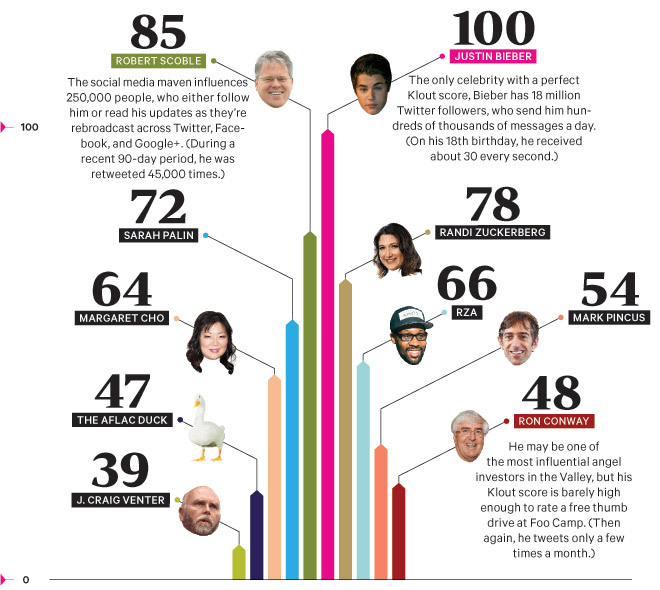 Do you track your Klout Score? Tell me in the comments! You’re way up on me…I’m not sure what this post is about. Thanks! My score was only in the 20s when my professional Twitter was the one linked account. I think part of my goal (which I might add to this post) is to raise my score via Twitter specifically.